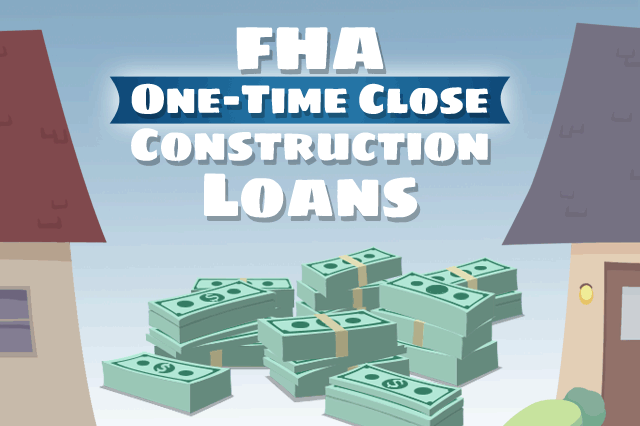 Are You Ready for an FHA One-Time Close Construction Loan? There are important things to consider before you start discussing your needs with a participating FHA lender, and coming into this mortgage loan process fully prepared will definitely save you a great deal of time. November 8, 2018 - There are important things to consider before you start discussing your needs with a participating FHA lender, and coming into this mortgage loan process fully prepared will definitely save you a great deal of time. Do You Understand the FHA One-Time Close Loan? That means that a single application and closing date will apply. But FHA OTC mortgages require building permits and other paperwork depending on the housing market; borrowers are urged to consider the time it takes to obtain the building permits when planning such a mortgage loan with the lender. It’s wise to make sure you can get the permits first before spending money on an architect, purchasing plans, etc. If you haven’t considered the land ownership issue before planning your new FHA OTC loan, this is a key factor to add to your checklist. One very important way these loans are different is that they require the borrower to hire contractors and other third parties, and payments to those third parties requires the use of escrow. The FHA loan handbook, HUD 4000.1, states that the borrower may be permitted to act as his or her own contractor, but that no cash back to the borrower is permitted outside legitimate expenses and the actual cost of those expenses. Even though FHA One-Time Close loans technically allow you to do your own work, your participating FHA lender may have rules that do not allow the borrower to do so. This is a circumstance common for FHA mortgages; the lender is not required to offer all types of FHA mortgages, nor is the lender required to permit the borrower to act as her own general contractor for purposes of building or improving a home. You may find that certain lenders with certain types of loans are more lenient in this area, such as for FHA Limited 203(k) Rehab loans. But a major construction project may be deemed too much of a risk to allow anything but an FHA-approved third party to do the work. Talk to your loan officer about these issues and related factors such as the addition of funds for an FHA Energy Efficient Mortgage package that can pay for approved energy-saving add-ons to the home. You have a great deal of options with an FHA One-Time Close construction loan that can help you build your dream home. We have done extensive research on One-Time Close / Single-Close construction loans and spoke directly to the licensed lenders for most states. These are qualified mortgage loan officers who work for lenders that know the product well. Your response to onetimeclose@fha.com authorizes us to share your personal information with a licensed mortgage lender in your area to contact you.